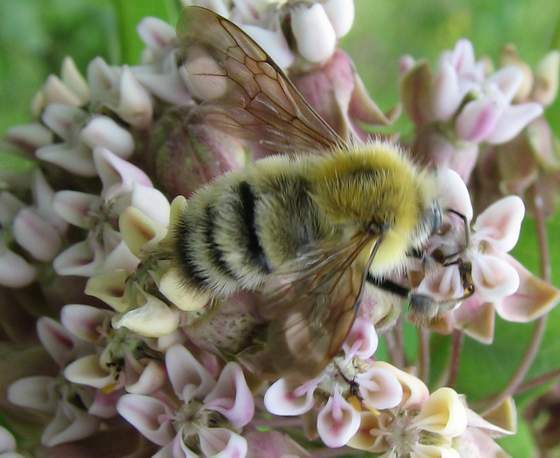 Second to Honey Bees, Bumble Bees are the kind of bees we are most familiar with. Unlike most native bees, which are solitary, and like Honey Bees, Bumble Bees live in colonies or hives with a queen and a number of workers. Their colonies last only a year, starting in the spring and dying out usually in the late fall. The only survivors of the season are the young mated queens. The old queen, all the workers and the males or drones don’t live through the winter. Bumble Bee colonies are usually underground. In the spring the young queen finds a hole, usually an abandoned mouse burrow, prepares it as a nest and starts raising a family. Bumble Bees range in size between 0.4 and 0.9 in. Workers are smaller than queens, drones are even smaller. If you see a pair mating in the fall you will notice the large difference in size. Queens are usually seen in the spring and the fall; the rest of the summer season only the workers are around while the queen stays in the nest laying eggs. Bumble Bees, especially the queens, are larger than honey bees, very hairy, black with some yellow and or orange stripes on the abdomen and thorax. The females have pollen baskets on their hind legs similar to those of Honey Bees and quite different from the pollen brushes of other bees. 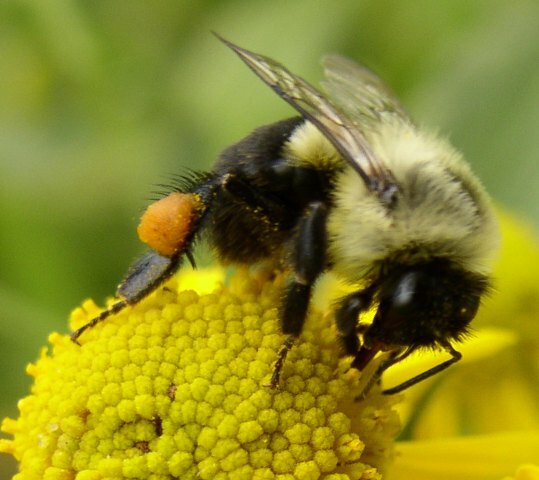 The Bumble Bee can pack the pollen into a fairly solid mass. 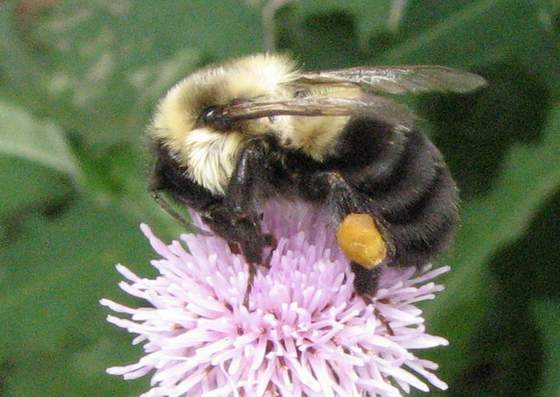 Two species are very common particularly in the east: the Common Eastern Bumble Bee and the Confusing Bumble Bee. In the west there are other Bumble Bees; a very attractive one is the Red Belted Bumble Bee. Habitat. A very wide range of habitats, from farms and gardens to large cities’ downtown. Season. It starts flying as early as March and continues until October. In southern states, the season is practically year round. Flowers. Many different kinds of flowers. Their tongues are long enough that they can reach the nectar of some deeper flowers. A good time to see them is in the fall when goldenrods are in bloom. It is a bird! No, it is a moth, a hummingbird moth. You can easily be fooled by this little gem of a moth. It looks and sounds like a miniature hummingbird when suspended in the air in front of a flower; wings fluttering so fast that they are just a blur and emitting a buzz quite similar to that a hummingbird makes when in flight. 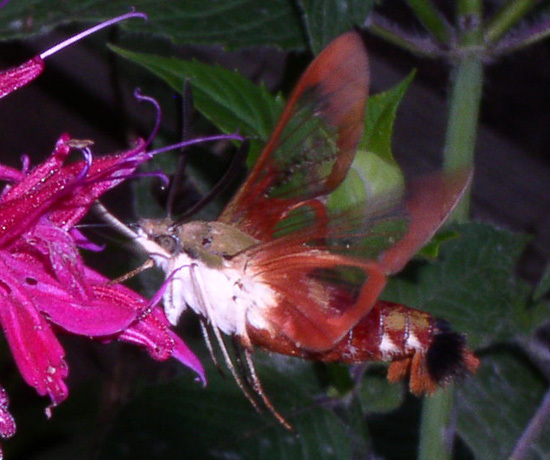 Hummingbird moths are one of the exceptions to the general rule that moths fly at night. They do it in the sunshine and visit flowers that bloom during the day, most commonly, long throated flowers. Like other moths and like butterflies they have a long tongue which they can unfold and use for drinking well hidden nectar that many other insects cannot reach. When they do so, some pollen adheres to their tongues and gets carried away to other flowers, where it performs pollination. Another name for this moth is clearwing moth because of the see through patches without scales on its wings. It is rather chunky, with a tail that can open like a fan. The color is a rich reddish brown, with some greenish shades. Habitat. Fields, forest edges, gardens. Season. They are most commonly seen from May to August, although in southern states they start flying earlier and stay through autumn. Flowers. 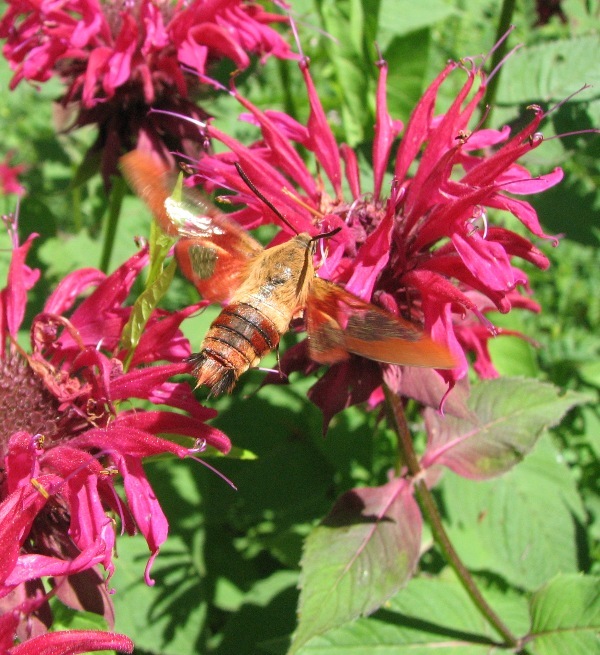 They take nectar from deep throated flowers such as honeysuckle, bee balm or horse mint, clover, phlox, petunia. Bee balm is probably their favorite. The bee everybody is most familiar with is the domesticated one, the Honey Bee, from which we get honey and wax. This bee was brought from Europe by the settlers; there weren’t any honey bees in this continent before that time. Honey bees vary in color from “blonde”, a light tan, to “brunette”, nearly black. Most are tan with darker stripes. They are fairly hairy and about the size of a house fly, between 0.4 to 0.6 in. The most distinguishing feature is the baskets that females have on the hind legs or third pair of legs. This basket, also called corbicula, is made of two rows of stiff hairs, called setae, forming a kind of basket around the flattened section of the leg. The bee can pack a lot of pollen in these baskets to carry home. Honey Bees form large colonies, called hives, composed of a queen, many workers and some drones or males. The queen’s only function is to lay eggs and is assisted by workers all the time. The workers are all females, daughters of the queen. The drones don’t do any work around the hive nor gather pollen or nectar; their only purpose is to mate with new queens so new colonies can get started. In addition to producing honey and wax, honey bees pollinate a wide range of flowers, many of them, such as almonds, very important for agriculture. It is said that their value as pollinators is as much as twenty times that of honey. Habitat. Feral honey bees can be found in almost any habitat, but more commonly near farms, or even towns and cities. Season. They start flying as early as March and last until October or even November. They can be seen in winter if the weather is mild. Flowers. Many crops, peaches, apples, etc. They also visit many types of wildflowers that bloom in different seasons. Plant a pollinator garden. Turn some of your lawn into a wildflower meadow. One major objection of gardeners, the fear of stings, doesn’t need to be a serious concern. Most native bees are quite different in this respect from honeybees and hornets; they hardly ever sting and if they do, it is very mild. In fact there are some, such as the Andrenids, that are incapable of doing so. Their stingers are too small to penetrate human skin. Avoid pesticides or if you absolutely need to use them, inform yourself carefully about the specific pesticides that kill only the target species, rather than decimating many others unintentionally. Furthermore, avoiding pesticides may not be as bad as it sounds since nature has its own checks and balances and manages to keep most pests under control without resorting to pesticides. There are some cases in which use of pesticides backfires by destroying these checks and balances. Avoid herbicides also; they can be bad for pollinators. They either deprive them of food or poison them. Plant native flowers, that is flowers that grow locally, not just native to the United States; these are best for pollinators. Some bees may be able to adapt to non-native plants, such as many fruit trees or some of the less fancy cultivars. But native pollinators and native plants have become mutually adapted through millions of years, so they make the perfect match in most cases. Grow a variety of flowers that bloom through the seasons. This is good for native bees; fortunately this is also what most gardeners aspire to have in their gardens. However highly selected cultivars or those with doubled-flowers don’t take care of the needs of pollinators. In general they have lost all the cues that pollinators need, such as scent. 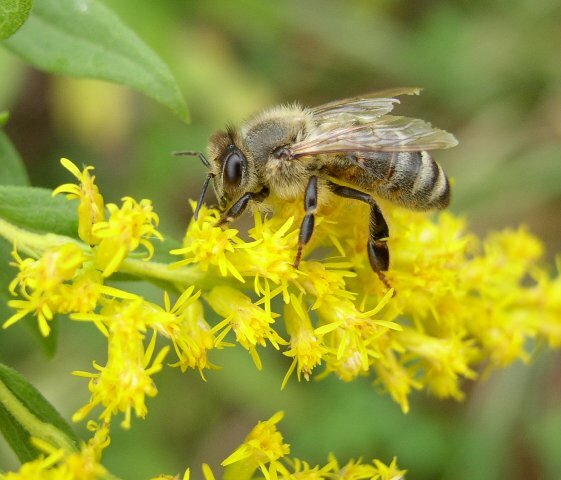 In some cases, they have also lost the pollen or nectar and so they don’t provide any food to bees. 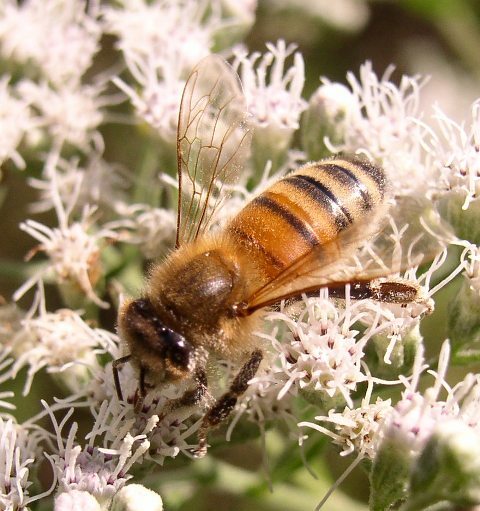 Plant the kind of lawn that provides habitat beneficial to bees. A perfectly manicured, pesticide saturated lawn is a desert to wildlife, including pollinators. Reducing the size of the lawn would benefit native pollinators. But it is also possible to have a lawn that is good for bees while being esthetically pleasing. As mentioned before, stay away from pesticides and herbicides as much as possible. Second, allow some small wildflowers; the look of your lawn may change as a result but it will continue to serve its purpose. Clover is great food for native bees; it also fixes nitrogen cutting down the need for fertilizers. Other small plants that benefit bees are ground speedwells (Veronica), wood sorrel (Oxalis acetosella), smartweeds or knotweeds (Polygonum), wild strawberries (Fragaria, several species), etc. Rather than calling them weeds we should call them grass companions or pollinator food. Provide housing for bees. A simple bare spot here and there (no mulch or grass, just bare soil) may be enough for a few hard-working soil nesters. A sand pile may be even better. It bears repeating: There is no real need to worry about stings from solitary bees. Dead logs or snags can supply housing for bees. You probably can’t have a dead tree on your property, but it is possible to keep a stump or a standing log and use it as an attractive planter; perhaps it will in turn provide housing for some little bees. Drilling holes on an old post or even a tree trunk would also make good nesting sites. They should be 3/32” to 3/8” in diameter and at least 4” deep. Or you can make your own bee houses. It is possible and relatively easy to build one by following instructions posted in several websites. Or you can buy one; some resources listed below. I have discovered that watching the comings and goings of those busy mother bees can be as much fun as observing a bird house. Once again, stings don’t seem to be a real problem; I have had my face right in front of their houses and have even let them climb on my finger without any consequences. Hollow tubes, just about the size of drinking straws, can also be used as bee nests. Some of the suppliers listed sell them. You can also tie up a bunch of hollow twigs, such as elderberry, or paper drinking straws (plastic ones are no good) together or pack them into a container such as a small milk or cream carton and place them horizontally. They should be closed at one end with the open end facing south or southeast. If you have trouble figuring out where the south is, step outside sometime between 10 AM and 1 PM and face the sun. That is how you want to place the nests. (See links below for instructions). You can let some of your ornamental grasses stay all winter; they can be quite handsome and add variety to your winter landscape while providing nesting to your friendly native bees. Helping the native bees would benefit us because of their invaluable services to the environment and to our gardens.